You're playing in a multiple deck game, where soft doubling is allowed, and are dealt an Ace and a two. The dealer has a six as his upcard. You obviously won't be standing, because you can take a risk-free hit to your hand which can only improve things for you. But there's also another option - you could double on the soft hand. Is such a move appropriate? Before we start, let's reiterate what we usually do when we talk about soft hands - it's not "3 or 13" or "Soft 13." It's always referred to as "Ace-two." That having been said, yes, with this hand, you've got the total of either 3 or 13. And the dealer is sitting with an upcard that is rather disadvantageous for him; one he'll bust with about 43% of the time. You can't really be any worse off by adding any card to this hand, but think about the cards which will enhance what you're doing - a four, a five, a six, a seven or an eight. With each one of these cards added to what you already have, you're putting yourself in a position where you have a pat (standing) hand. You've got about a 9% positive margin here between winning and losing hands, representing a nice positive expectation. 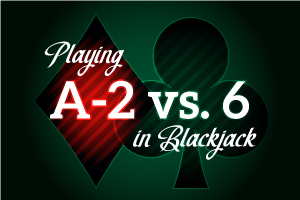 If you simply hit the hand, you'll make a better hand than the dealer 55% of the time, but once again, the difference which makes doubling down a little better is that, of course, you've got double the action out there. In this case, you're better off getting more money out there on the table.